I still have vintage on my mind these days. I’m still trying to get lots of wear out of my vintage brooches, still pinning them onto my sweaters and blazers before I have to cover them up with a winter coat. 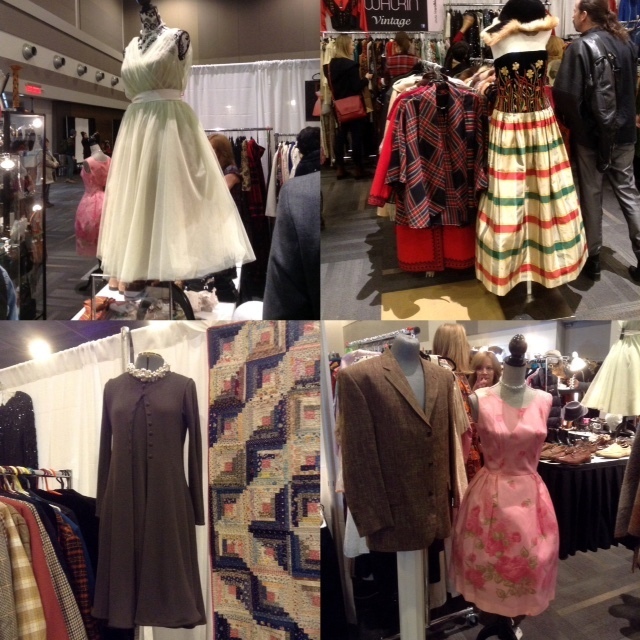 Still mentally drooling over all the lovely frocks and coats I saw at the Ottawa Vintage Clothing Show two weeks ago. Fifties style dresses seemed to be big this year. See. Doesn’t that white dress, above, look a bit like the one Marilyn Monroe wore in Seven Year Itch? And even more like the one Elizabeth Taylor wore in Cat on a Hot Tin Roof? I love Taylor’s movies, especially that one. Because…uh… Paul Newman. But also because I love Tennessee Williams’ plays, deeply depressing though they may be. And seriously, no one could rock a white dress better than Liz Taylor. Not even Marilyn. I snagged myself a bracelet for ten bucks at a booth that was having a “Going Out of Vintage” sale. That was a find for me; I’m a hard fit. My wrists are really thin, and most bracelets simply fall off me unless I keep my arm bent. Maybe I should take up smoking again? 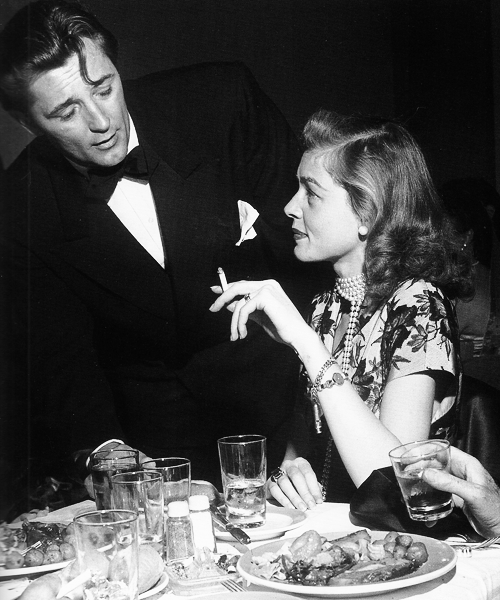 I bet Lauren Bacall never had any problem keeping her bracelet on when she was holding her cigarette. Still there is the whole health thing, and the anti-social thing. And it will be thirty-one years next week since I quit. So… nah. Forget I said that. 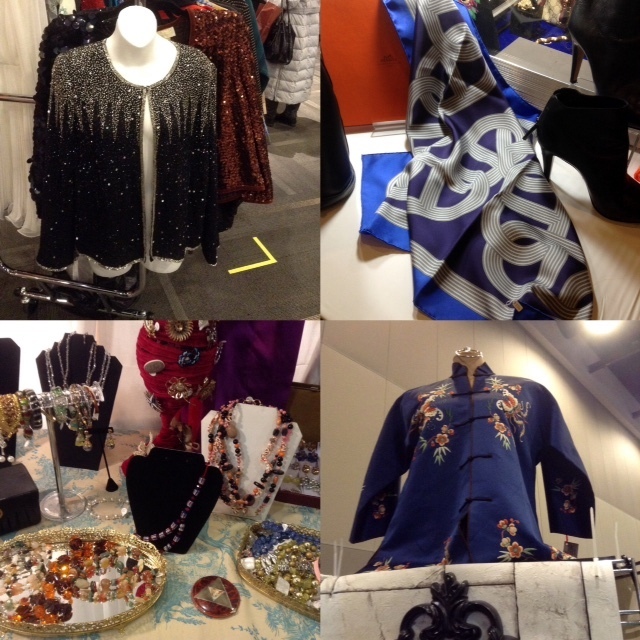 There were all kinds of accessories at the show, other than scarves and bracelets. Like some seriously cool sunglasses from the sixties and seventies. Okay, I will admit they looked kind of dorky on me. 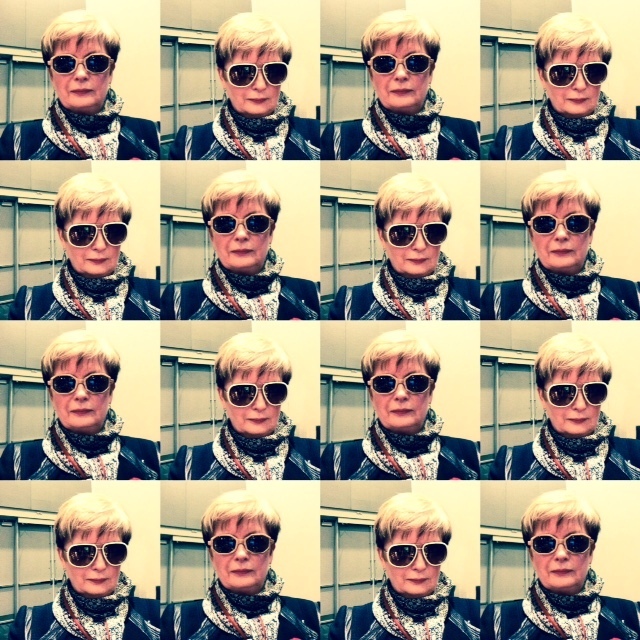 But still, it was fun to try them on, snap a picture, replace them, and then walk away… quickly. Just messing around with my new ap on my i-pad. Trying to up the cool factor. But the best thing about the Vintage Clothing Show for me is always the hats. I’m crazy for vintage hats. I already own several. Some are quite dressy, one might even say a bit showy. Some are more casual like my brown beret from the forties, below. I love my beret. Especially the Bakelite brooch that came pinned to it. At under ten bucks, this was a find, considering what one has to pay for Bakelite jewellry these days. When the hat falls apart, I’ll remove the brooch and wear it on its own. And this year, I managed to snap up another great hat for my collection. See. It’s an odd little thing, really. 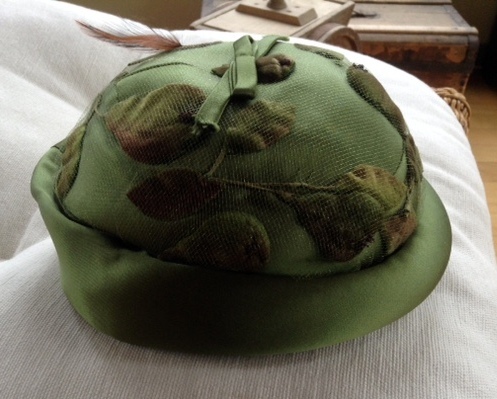 It has a puffy brim, and pears and leaves appliqued onto the crown and covered in netting. And a sweet little brown feather. My newly acquired odd little 50’s beanie. Part Elizabethan boy’s costume. Like you might see Tybalt or Mercutio wear in Romeo and Juliet. Seriously. 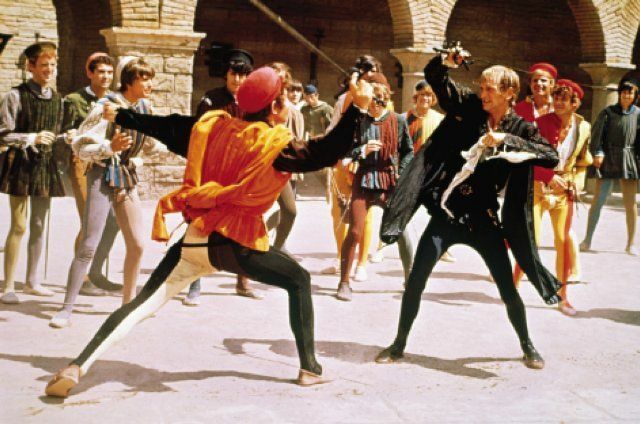 Have a look at this shot from Franco Zefferelli’s 1968 film … which you have to admit is the definitive R & J movie. But no matter that I look like I might break out into sword-play… I love my new hat. 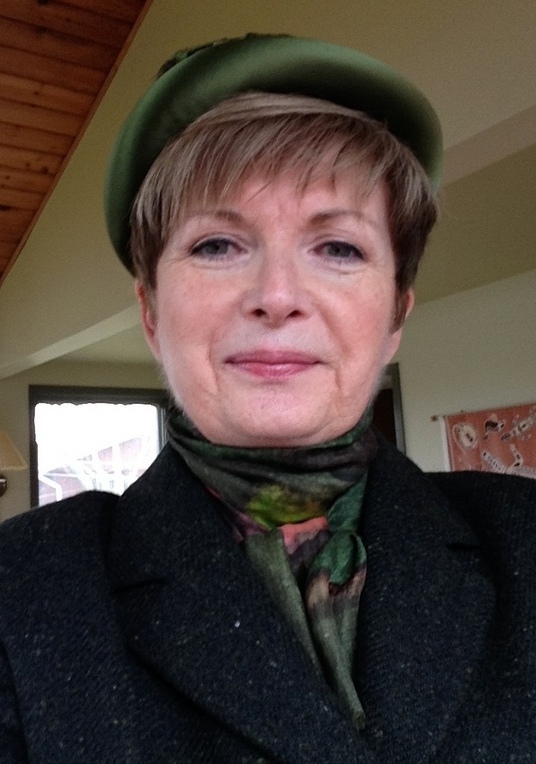 And it goes perfectly with my green tweed blazer and this really old green silk scarf, that I’ve had since university. Making it vintage as well… sadly. After last week’s post… that’s me done paying homage to vintage for a while. And hat satiated… for now, anyway. I do admit to being very well hatted, when it comes to vintage. Maybe a bit too well hatted. Maybe I had better start finding places and events where I might wear some of my hats. Any ideas? High tea with the Governor General’s wife? A winter wedding in old Quebec City? Roller skating? I need some help here, people. Where does one wear vintage headgear these days? I mean besides the Ottawa Vintage Clothing Show, that is? Good point… I'm sure that scarf owes me money. Since I bought it when I was a student, I know I didn't pay much for it. I've just always loved the mix of colours in it. Thanks, Marea. Shopping vintage is such fun…even if you don't buy. Just looking is an adventure. I love that expression "you have a good hat face" and it's true, your face does look like it's made for a hat. Lucky you, I have a long beaky face when I put a hat on – I shall blame my father for that. Just found you today through Patti (yes, you probably weren't lost, I know). Anyway, I'm an over 50's blogger too and have only run my blog for 6 months so am still finding my feet. You have a lovely friendly face, so thought I'd stop to say hello. You live in a very beautiful part of the world. I'm a Scot living in England. Do pop across to see me and say hello if you want to. Elizabeth Taylor could rock anything in my book. There is this wonderful old film from the 1950s (I think) in which she's in love with Vittorio Gassman. The wardrobe in that film is absolutely extraordinary. I watched it not too long ago on my iPad and screen captured some of her outfits to revisit, just because they were so amazing. 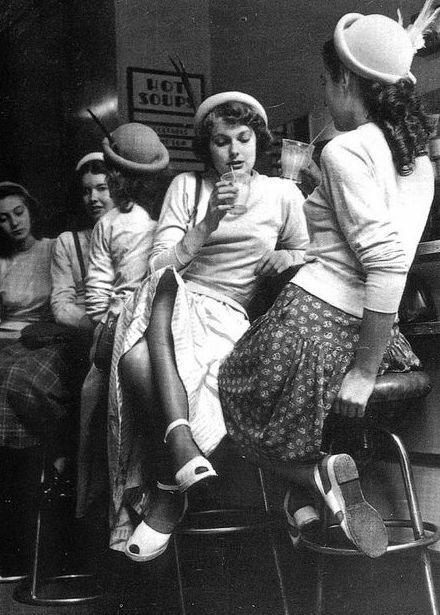 So let's hear it for these vintage looks… and I love the hats on you!!! Thanks, Rosie. I never saw myself as a hat person until I started trying vintage ones. Big brimmed sun hats, or cloches look absolutely ridiculous on me. 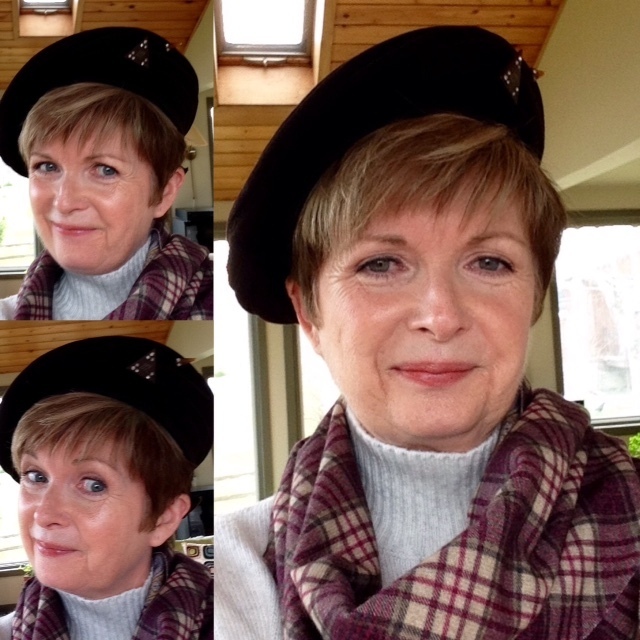 With my big head & round face …can't pull off the Sophia Lauren, Audrey Hepburn hat look at all! Hey… don't knock it… woolly hats are very on trend! You are rocking that hat – it looks great. I am now feeling inspired to explore more vintage shops (we have a couple in our town that I've never ventured into). My husband has bought me a vintage brooch for my birthday (well, in truth I've bought it, he just needs to sign the card) so that's a good start I feel. Love your blog. Thanks so much Amy. Love that story… "He just needs to sign the card." Hope you picked out a nice one! Well, thanks, Kezzie. I love anyone who loves brooches… and vintage. Pop by anytime. Thanks, Dawn Lucy. Me too… seem that movie a hundred times. Still like it better than the 90's remake. Thanks, Arlene. My new ap is "layout." I tried it originall with Instagram, and am now using it for other things. Learning new things is such fun… when there's no test… or marking!